Astrology, a cosmological or chaotic creature? 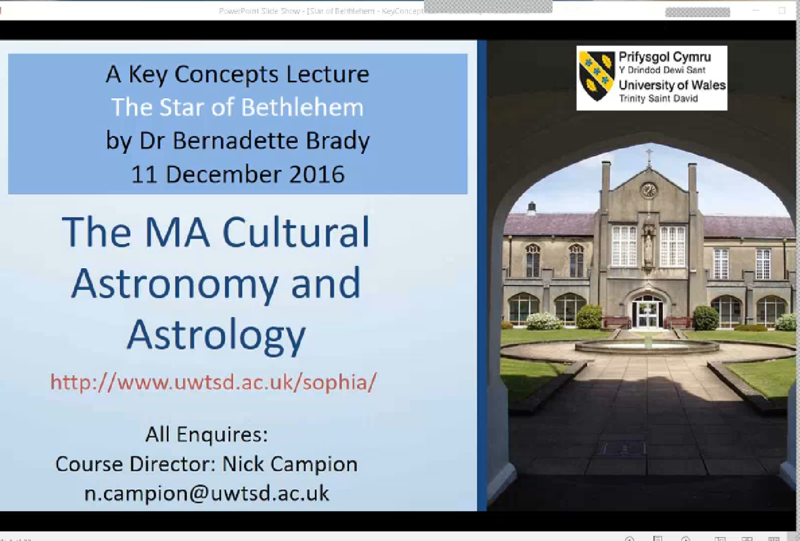 Lecture by Bernadette Brady to the students of the MA of Cultural Astronomy and Astrology at the Bath, UK Summer School, June 2016. It lecture explores the possible ontological roots of astrology and looks at astrology having more of a link to chaos then to the perfect world of cosmos. This is a Key Concepts lecture for the MA in Cutlural Astronomy and Astrology. The first five minutes of this lecture introduces the MA to the audience. It then explores the history, the primary sources, the evidence, the visuals, and the different theories of the star and the questions that arise. Finally, with the aid of Stellarium, Brady steps you onto the Temple Mount, Jerusalem, and looks towards Bethlehem but with a view informed by the sky knowledge of the first century magi, the Mesopotamian astrologer/priest. Brady shows that the Star of Bethlehem may not be a single bright star but instead a sky narrative written in the poetic astronomy used in the first century CE.